On September 7 and 8, Hunter Library hosted its annual Library Student Orientation event. New and returning student workers enjoyed refreshments and participated in several activities to get to know their new co-workers. The Dean of Library Services, Dr. Farzaneh Razzaghi, welcomed students and thanked them for their important contributions to the library. 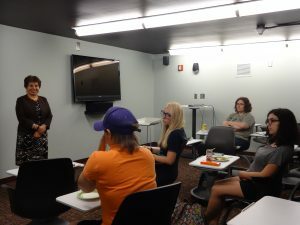 She reminded attendees that their academic pursuits should remain the top priority while working but emphasized how valuable professional and soft skills gained at Hunter Library would be to their future careers. New students received a behind-the-scenes tour of the library to better understand how each department works together to provide resources and services.